All states require that occupational therapists and occupational therapy assistants obtain state licensure in order to practice. However, the path to gaining your occupational therapy license differs from state to state, which can make the process a little tricky. Some states have simple applications that get approved in a week, whereas others can take months. Some state boards have all necessary information on their website, while others require multiple phone calls and knowing just the right questions to ask. Once you pass the NBCOT exam, you’re excited to dive into work and start your career. Not being prepared for your state’s licensing process can delay your ability to gain employment, which can be very frustrating — and you certainly don’t want to experience burnout before you even begin! 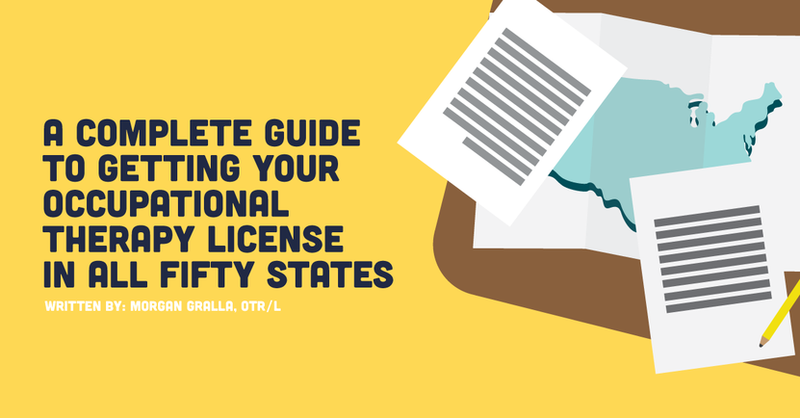 After going through an obstacle course to get my state license, I felt that a central resource needed to exist that contains all information on the licensing process for every state. NewGradOccupationalTherapy.com graciously supported that idea and offered me the chance to build it. Below is a list of initial licensing requirements for all 50 states as well as the District of Columbia. While I did a good bit of research to collect this information, I definitely cannot take all credit. I reached out to the online OT community to work on this together, because who better knows a state’s licensing process than someone who went through it? By crowdsourcing this information, a lot of recently-licensed OT were able to provide an “insider’s perspective” for their state, helping remove the obstacles to licensure for future OTs. Hopefully this can be a great resource for new or soon-to-be OT grads, as well as travel OTs, those who are moving, or OTs who just want to expand their options. Licensing requirements change over time, especially as applications are converted into an online format. It is strongly advised that you visit your state’s licensing website and/or contact your state’s regulatory body to ensure the information is correct. This list is also geared toward common requirements for both OT and OTA applicants, so you may need to check if there are additional requirements for your license type (e.g. OTAs often need to submit a supervision form). Note: Fees are approximations. There may be additional fees or different fees for obtaining fingerprinting if not residing in the state you are applying for an occupational therapy license. There may also be other fees associated with obtaining documents, having scores and/or transcripts sent, or notarizing documents. This guide was updated on 07/20/18. Any changes to state licensure requirements occurring after this date may not be accounted for.